By the end of the week, all the hollowing decorations will probably be down and put back into storage. They’ll be replaced with the Thanksgiving decorations that will be quickly followed by the Christmas decorations. Aren’t you glad you only decorate at this time of the year? Hopefully, you have these decorations all organized and stored in a place that’s easy to get to. However, if you have discovered that since the last time you pull down these decorations there has been a junk barricade put up, then it’s time to bring it down. That’s a task tailor-made for Junk King Atlanta South. 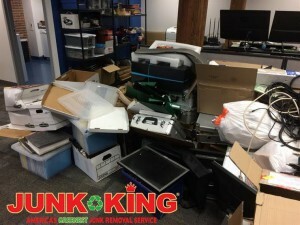 When you hire Junk King Atlanta South, you’re hiring your own personal removal crew. This is the team that shows up with a positive attitude ready to take on any challenge you might present them. And there have been plenty of challenges! In the past, junk King crews have navigated pianos down staircases, taken apart hot tubs and dismantled swing sets. Then there’s all the heavy furniture they’ve lifted and loaded onto the truck. The same please know in to the amount of help they can provide in getting rid of unwanted clutter. The first thing the Junk King crew always does once they arrive is to look over all the things you want to get rid of. They are sizing up how it’s going to fit on the back of the truck. They can look at any amount of junk, even if the pieces are scattered throughout the house, and know exactly how much space it will take on the back of the truck. That’s when the present you with an estimate. Their goal is always to get as much into as little space as possible. What happens of the wrong? If your stuff takes up more room, then you’ll pay the original price. If it takes up less, then you’ll pay less. That’s how their Junk King is and they never want add any surprise charges. Included in the rate is the disposal of the stuff. Unlike other so-called professional junk haulers, Junk King Atlanta South doesn’t automatically take what you’re tossing out to a landfill. Although that would be easy for them, it’s not great for the environment. They would much rather drop your things off at a recycling center or charity that way they know what you’re giving away can be repurposed. Your holidays should be merry, bright and junk free. Junk King Atlanta South can take care of the junk part! This entry was posted in Atlanta South Junk Removal and tagged holidays, junk, junk king, junk removal on October 31, 2017 by Junk King. Last updated October 31, 2017 .